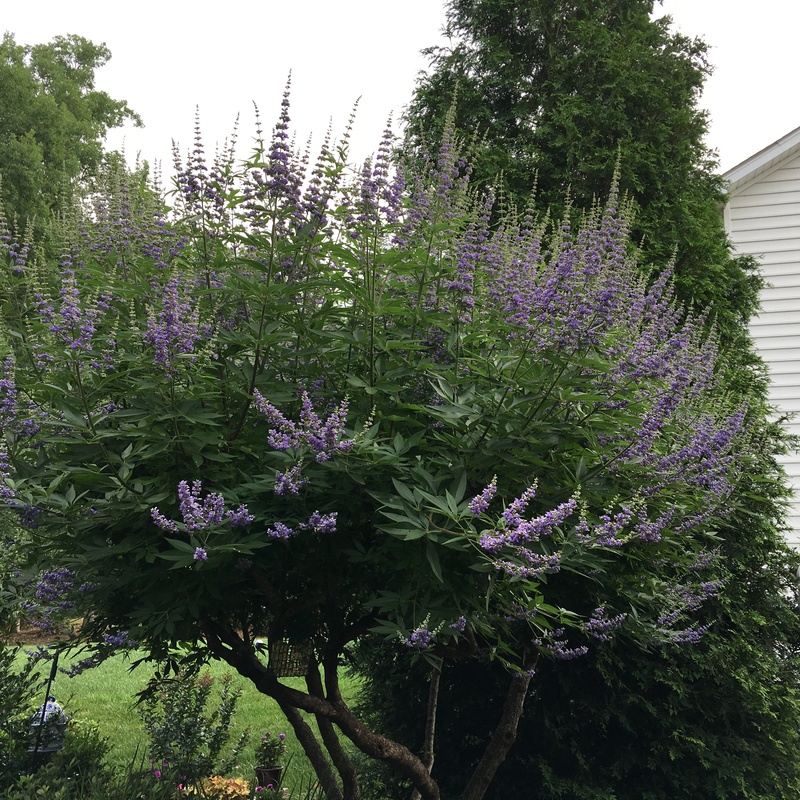 I look forward to June each year as a time when my chaste tree (Vitex agnus-castus) comes into bloom. My unidentified heirloom variety is approaching full bloom. It seems to be a promising choice for In a Vase on Monday. The blue vase is one we purchased in Japan all those many years ago and has stayed with us over five moves. Last winter I pruned the vitex heavily and it has responded with vigorous new growth. It promises to be a banner year. One of the wonderful attributes of this plant is that it responds so well to deadheading. If I can get up high enough (my Arranger has strict rules to keep me low on the ladder) to remove the spent flowers, it will rebloom completely. That is a winner; it came from a second generation cutting from my aunt and was originally in my grandmother’s garden. The bees love it as much as I do. Please visit Cathy at Rambling in the Garden to see what she and others have put in their vases this week. 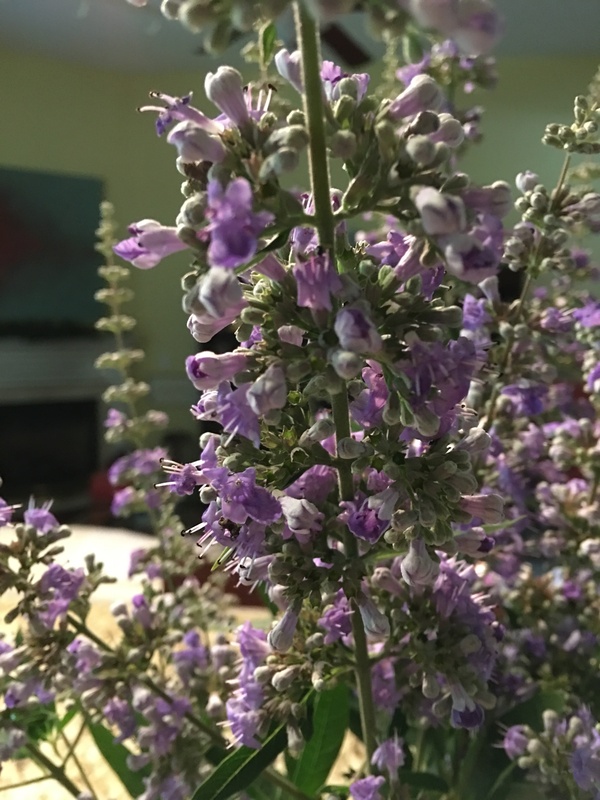 This entry was posted in Gardening, In a Vase on Monday and tagged chaste tree, Rambling in the Garden, Vitex agnus-castus. Bookmark the permalink. I don’t think I’ve ever seen one of these! Does it have a scent? It has a very, very mild scent (you have to get your nose in the flower), but it surely does do something for the bees. John what a magnificent tree and how gorgeous in the vase….makes quite a statement in the garden and vase. Its history and its beauty make it one of my favorites. 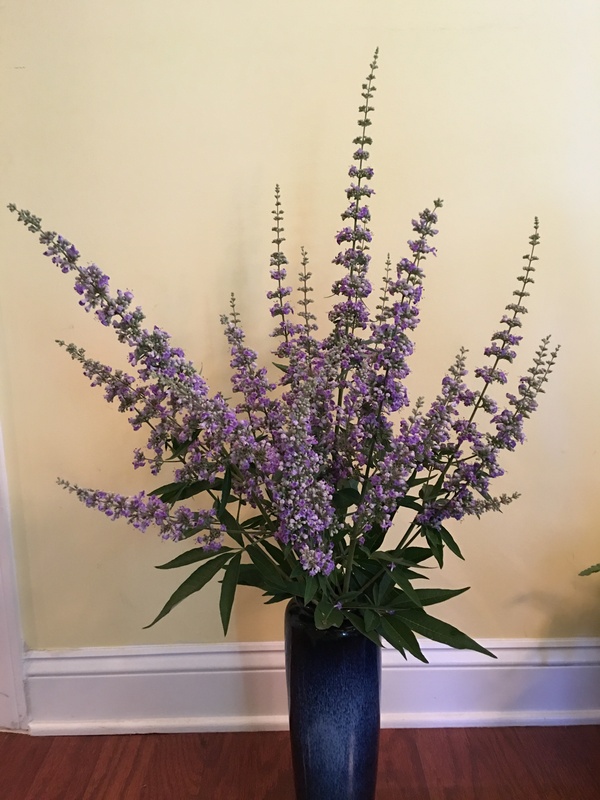 This reminds me of a cross between a lilac and butterfly bush. It is lovely and how long do the cut stems last? They last well, but the individual flowers begin to fall…and can make a mess, so we tend to count them as short lived. Thank you, Cathy. I think you realize how special this kind of thing is in a garden…history! I agree that that is lovely. I know how pruning does wonders. My husband prunes our dwarf lilac and it goes crazy with new shoots and flowers. Vitex can take a severe pruning and still produce. I wish my husband and I had more land than we do. I’d love to have more flowers and bushes and trees. Best I can say is go for it. Thank you, Susie. It has been quite special this year. Thanks, Annette. I’m grateful for your kind comment. I will remember and do a post on it. I had it pruned in winter to the point it looked like sticks, but it surely has come out strong. Looks wonderful! I wonder how it got that common name? I have heard that it was used (potion? salve? herb?) to keep monks chaste. I never tried it. I’m glad you like them. Thank you.